Older adults talk about aging, but often from a narrow perspective. Stereotypes of young adults can sidetrack their conversation. But put both young and old around a table to discuss aging, and the discussion is likely to be wide ranging and enlightening. That’s what happened May 28 at Kendal at Oberlin and three other Kendal locations. 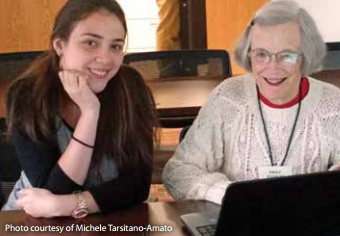 “Deepening the Conversation on Aging” brought together hundreds of people, ages 15 to 95 and of diverse backgrounds, for a virtual conference focusing on retirement security and other aging issues. The daylong event was sponsored by The Kendal Corporation, Philadelphia public broadcasting station WHYY and Next Avenue. Kendal Outreach Director Beryl Goldman got the idea for the conference after visiting Kendal at Oberlin and Kendal at Granville, where she brought high school students to septuagenarians together for a discussion, rather than in separate meetings. “Without a question, it was better to have all ages together. It enriched the conversation. There was no lecturing, it was really sharing,” Beryl said. A summary of the lively conversations that took place May 28 over lunch, in chat rooms and on Twitter was submitted to the 2015 White House Conference on Aging. The July 13 event streamed live at whitehouseconferenceonaging.gov. For 17-year-old Oberlin student Angel Riddle the event was an eye-opener. “I didn’t think older people would like talking to me. I thought I’d be on the sidelines, but people actually listened to what I had to say,” said Angel, who wrote her senior project on the conference. One thing they listened to was Angel’s idea for a Twitter training workshop. She teamed up with resident Larry Dunn and they held two boot camps. “I was pretty surprised how the residents picked up on Twitter,” she said. During the conference, Oberlin participants focused their conversation on healthy aging, and again technology came up as a way to foster health through intergenerational relationships. Did you miss the event? No worries! Download the Executive Summary of the 2015 Intergenerational Summit on Aging here! Prepared by The Kendal Corporation, this executive summary recaps the entire event, including Philadelphia, and Kendal communities near Oberlin, Columbus, Washington D.C. and New York City.